Chelsea’s on-loan midfielder Mateo Kovacic has heaped praise on team-mate Eden Hazard following a summer of transfer speculation linking him with his parent club Real Madrid. The Belgium international has long been linked with a move to the Bernabeu, particularly as he’s yet to sign a new contract at Stamford Bridge despite his current deal being up at the end of next season. 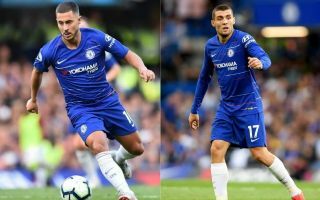 In the end, however, Kovacic and Hazard ended up playing together in west London as the Croatian midfielder made a loan move to the Blues for this season. This is despite the Daily Mail linking Real with a big bid for Hazard in the summer, and the Spanish giants’ president Florentino Perez may want to listen to these words from Kovacic as he gets a close look at him this term. ‘He’s very good. I didn’t know that he’s so good,’ Kovacic is quoted in the Metro. ‘Obviously I knew he was a great player but now when I see him playing with us every day and every week he is just incredible. It remains to be seen, of course, if Kovacic will return to Madrid after his loan, but at the moment CFC fans could potentially take this as a subtle message to his employers to raid his loan club for their best player.